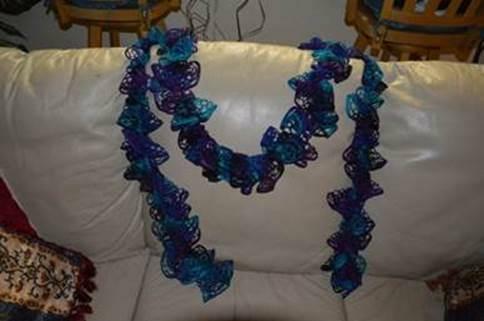 Want to learn how to make this beautiful frilly, scarf? Rachel is offering to set up an evening class in June for anyone who is interested in learning this technique. It is a very easy “no crochet” method using the Sashay yarn by Red Hart. All you need to bring is a skein of yarn (Michael’s has a good variety of colors on sale now), a crochet hook (size J or 10mm), and the willingness to learn. If you are interested in attending, please email Rachel at rachel.doyle@att.net. The scarves would make great Christmas gifts for your friends and family. Besides, it is always fun and exciting to learn something new! At our Summer Symposium on August 13th, we will make “Earth Buckets” and you will go home with a tomato plant ready for your fall garden. To minimize our costs, and to keep Deborah Stafford pleased with us, we need your recycling help. 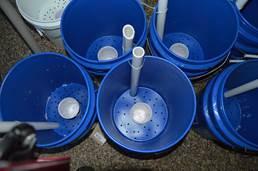 We need you to find and save 5 gallon plastic buckets. 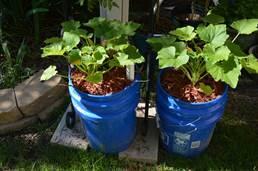 I purchased my buckets from Lowes and Home Depot, but at nearly $3 each, that could be costly for the Garden Club to provide 2 buckets for each member at the Symposium. (We will provide all the other supplies and tools.) Besides…. We need to learn to recycle. I am positive that there are lots of buckets out there – just waiting to be “repurposed.” Please help these buckets find a useful life! So – scour up some buckets before August. 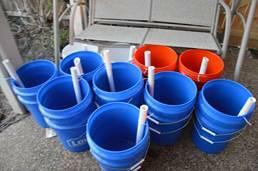 If you find a source for lots of buckets, please let me or Janet know. Wanted to thank everyone for the time, energy and commitment that was given to our school and community last Saturday. I am blessed to work among such caring people and I hope that we can all be a part of the growth of the Garden and more importantly of our children. A special thank you to Sally Ann and her commitment last fall to making this happen. You really motivated me to continue this process throughout the year! And thank you to Georgeann, Deborah, Andrea and Mary Ann and the entire Sunnyvale Garden Club for giving your time, resources and expertise to this project so freely! And certainly a big thank you to Todd and Kara Ranta, Greg and Kim Kilgore, Scott Blazek, the Powell Family, Cayle and Wendy Beard, Michelle Roquemore, Nancy Griffin, Mayor Phaup, and my sweet wife and kids for the sweat and labor given to this project!!! We all at the school are very excited about the potential that our Garden brings to our children. Our hope is that we can help our kids see and understand the importance of food and the decisions that we make everyday for the health of our bodies. And that they will develop an understanding of what a sustainable lifestyle can look like and how it can benefit themselves and their community. Thanks again for being a part of OUR Sunnyvale Community Garden! Things are really coming together! We hope you can join us for some portion of the Sunnyvale Elementary School Community Garden Work Day this Saturday, May 18 from 8:00 a.m. to noon. We’ve had multiple, highly productive planning meetings with “Nate Ann” Chrastina, the SES special education teacher and high school football coach who conceived and has spearheaded this project. Deborah and Marilyn Fitzner picked up free compost from Mesquite. Deborah will drive it up to the back of the school on Saturday, so that it can be worked into the beds. Deborah has already dug out one bed and has marked out a couple of more beds. 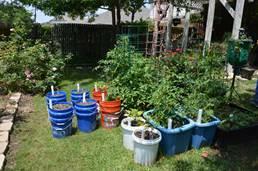 Deborah has donated cucumbers, purple basil and tomatoes to plant. We are looking for families to “adopt a plot” over the summer so that the garden will be in good shape for the kids when school starts up again this fall. In exchange, the family will get all of the produce from the garden plot they adopt and/or they can donate all or a portion of it to a food bank or church. There is a water spigot in general vicinity of the garden at the back of the school (Yeeaaaaahhh!) 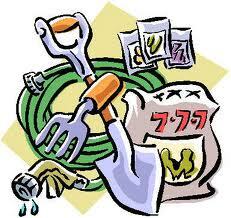 The school is using SGC’s monetary donation to purchase pavers, hoses, tools, etc. We’ll be building a ready-to-assemble shed, wooden trellis and pave stone beds on Saturday. Many thanks to the Kilgores for donating the trellis materials and to Michelle Roquemore for donating the sign. Date/Time: Tuesday, May 14, 2013 – 6:00 p.m. Donations for Sharing Life Outreach – please bring any canned meat items. 2013-2014 Membership Form/Dues– turn in your membership form and $35.00 membership dues to Mary Baughman to ensure that your name appears in the new year book.